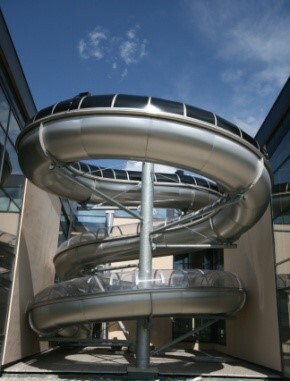 Our toboggans, slides, kamikaze water flumes and sidewinders slides in stainless steel for inside and outside swimming pools allow you to safely enjoy the pleasures of water and sliding. You can choose from a wide range of models, styles and finishes to equip your pool or your water park. 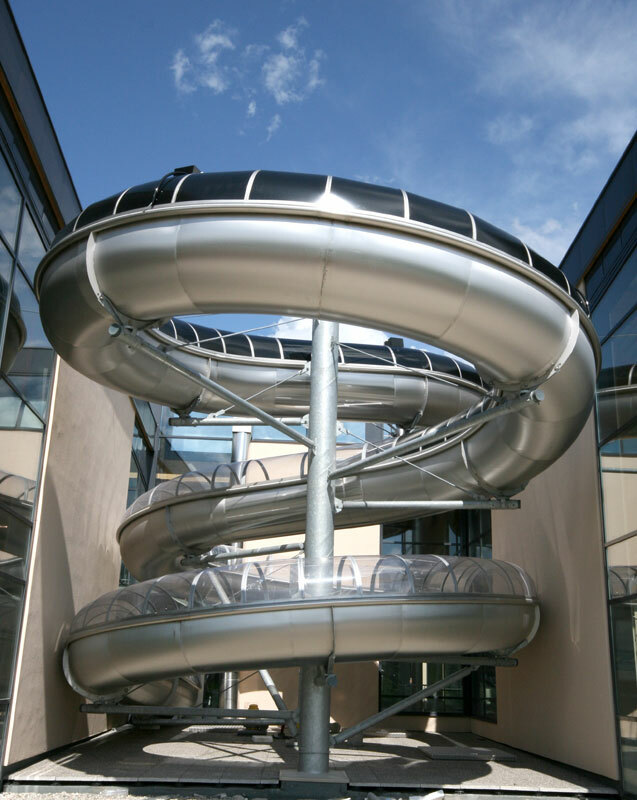 Our dry slides add a contemporary and fun look to a public or private building (shopping mall, airport, museum, restaurant …), playground or park. The benefits of stainless steel for sliding. For all these equipment, stainless steel is the material chosen for its unique qualities. It has no joints and is seamless, all junctions between the stainless steel parts of the slide bed are welded, sanded down and then polished. This improves user confort as the joints cannot be felt by the user during the slide, and the risk of injury is eliminated. Maintenance and repairs are minimized. Stainless steel is resistant to UV radiation, temperature fluctuations and frost. It is aesthetic and has a long lifespan of up to several decades. Sledding courses and summer Alpine Coasters/toboggan runs enhance tourist attraction to your area by attracting a wide audience eager to enjoy and relax in a natural setting. All these facilities are tailor-made designs to meet your needs and fit perfectly into their environment.